Hey everyone. The Head Coach spoke briefly with reporters this morning about Le Bowl D'Iron and what the team will be accomplishing during the next few months. On the game: ``There were some field-position issues that I wish we would have capitalized on more than we did. We had some chances in the second half that I wish we would have been able to capitalize on. Field-position issues at the end of the day, with special teams and things of that nature, that cost us some points." On what Auburn will do between now and the bowl announcement: ``We'll really focus on academic world, not that we don't usually, and we're going to give our guys some time to heal up. They're beat up and bruised up. Guys were playing with all kinds of injuries. We'll give them an opportunity for their bodies to heal." On his decision to play Drew Cole, who may have been eligible for a medical redshirt, against Alabama: ``We wanted to make sure that we played anybody and everybody that we thought could help us win that game ... that made sense. He's been getting healthier." On his role in bowl selection: ``I'm worried about recruiting -- that's what I'm worried about right now. We're hitting the road asap." He said recruits who attended the game, who still are on campus at this hour, were enthralled with the atmosphere. Hey everyone. I'm trying to wrap it up from Jordan-Hare Stadium, where my fingers are all but frozen. I have lost feeling in my right big toe. I gotta make this somewhat quick. Auburn's defense was really good. Alabama rushed for 73 yards. Ingram had 30 on 16 carries. Alabama converted five third downs Friday. Three of those came during the final drive. Auburn rushed for 151 yards, though 67 of that came on Terrell Zachery's reverse. He was Auburn's leading rusher. Ben Tate finished with 45 yards on 18 carries. Gene Chizik on if today's loss signifies progress: ``I don't think you can sit there and watch our football team play against Alabama and not think that. We've come a long way. Again, we said at the beginning of this (season) that we were going to build a foundation for what we know is right. We are going to do it right. I don't think there is any question." Ben Tate on the final drive: ``We weren't going fast enough. I got kind of worried. At first, I was like: We've got this, we've got this. We were running fast enough. If we'd have had more time, we would have gone down and made something happen. That was just our fault offensively. We were moving too slow. We had to pick up our pace. We didn't." Craig Stevens on how they stopped Alabama's rushing attack: ``Just doing what we're supposed to and not try to be Superman. Just play your position and do only what you have to do." Stevens on holding Ingram to 30 yards: ``That's a big victory for us -- especially with us having those injuries and Jonathan having to step up. Just stopping a player like Mark Ingram. That's a big statement for us." 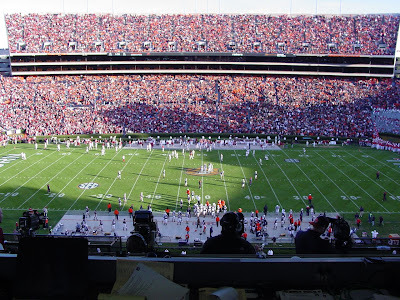 Darvin Adams on how Auburn threw deep according to the plays Alabama called: ``Our coaches figured out their signals and we were able to take advantage." Antonio Coleman in his own words: ``I had tears walking off the field. 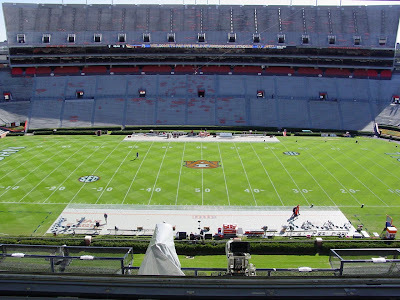 It finally set in that I'd never be walking on that field again in an Auburn uniform. The only time I'm coming back now I'll be standing on the sidelines cheering these guys on so it's tough, but I have one more month with these guys, bowl game. Like I said before, I'm going to ask these guys again to lay it out on the field for me and I'm going to do the same for you." Hey everyone. We're now watching and discussing the second half. Auburn first possession: PUNT. Three and out. Alabama first possession: PUNT. Three and out. Auburn second possession: TOUCHDOWN. Darvin Adams 71 pass from Todd. Byrum PAT kick good. Drive covered 76 yards in 2 plays. Alabama second possession: TURNOVER ON DOWNS. Stopped on 4th-and-1. Auburn third possession: PUNT. Three and out. Alabama third possession: FIELD GOAL. Leigh Tiffin 27 FG. Drive covered 23 yards in 5 plays. Auburn fourth possession: FIELD GOAL. Tiffin 31 FG. Drive covered 29 yards in 7 yards. Auburn fifth possession: INTERCEPTION. Mark Barron. Alabama fifth possession: PUNT. They were pinned deep, couldn't accomplish much. 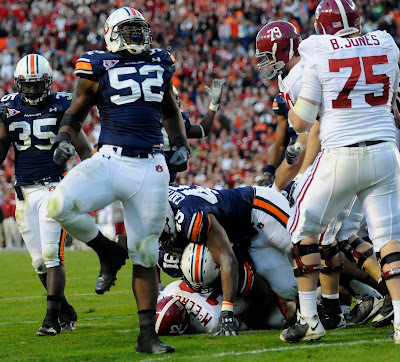 Auburn sixth possession: TOUCHDOWN. Roy Upchurch 4 pass from McElroy. Conversion attempt failed. Drive covered 79 yards in 15 plays. Auburn seventh possession: END OF HALF. Final pass was knocked down near the goal line. Hey everyone. We are watching Auburn's game against Alabama this afternoon. Please join in. The game can be seen on CBS. Alabama won the toss and elected to take the ball. Auburn first possession: TOUCHDOWN. Terrell Zachery 67 run. Was Byrum PAT kick good. Drive covered 80 yards in 4 plays. Auburn second possession: TOUCHDOWN. Eric Smith 1 pass from Chris Todd. Byrum PAT kick good. Drive covered 58 yards in 12 plays. Alabama second possession: PUNT. Three and out. Zero yards gained. Auburn third possession: PUNT. Three and out. Todd missed an easy first-down pass to Tommy Trott. Alabama third possession: TOUCHDOWN. Trent Richardson 2 run. Leigh Kiffin PAT kick good. Drive covered 58 yards in 10 plays. Auburn fourth possession: PUNT. Three and out. Alabama fourth possession: PUNT. Four and out. Auburn fifth possession: PUNT. Three and out. A personal foul on Walt McFadden put Auburn in a tight spot. Alabama fifth possession: TOUCHDOWN. Colin Peek 34 pass from Greg McElroy. Kiffin PAT kick good. Drive covered 45 yards in 5 plays. Auburn sixth possession: PUNT. Drove to the ALA 39, couldn't burrow deeper. Alabama sixth possession: END OF HALF. Le Stadium before most people arrived. Here is a collection of HOTTIES as seen near Samford Hall. Hey everyone. We have arrived at Le Stadium for Le Iron Bowl and, yes, it's mighty early. With Josh Moon in tow, I am now headed for a trip around the stadium in search of HOTTIES. UPDATE ONE: LB Eltoro Freeman is OUT for this game. He is dressed in sweatpants and jersey. NOTE: The official betting line has dropped to Alabama -9.5, which is three points off what I was seeing on Monday. That means a lot of money has been wagered on the Tigers. Hey everyone. From the warm kitchen of HABOTN Headquarters, where Wifey already is at work getting our 18-pound bird ready for a mid-afternoon meal, please accept my warmest regards on this Thanksgiving. I am truly thankful for all the HOTTIES who make this a rational and pleasant place to discuss ... almost anything. They said it couldn't be done. So we did it. UPDATE: Here is my big story on Chizik that ran in today's editions of the Advertiser. Many of the quotes will look familiar to you. Hey everyone. Auburn's excellent photographer, Todd Van Emst, is out around campus taking cool pictures of what's happening. Have a happy Thanksgiving, you HOTTIES. Hey everyone. We just spoke with offensive coordinator Gus Malzahn, who said a few things of interest. I'll lead with those and add comments from a few others. Gus Malzahn seemed more upbeat about TB Onterio McCalebb's status. If you'll recall, the freshman seemed to aggravate his ankle injury against Georgia. ``I think all of our guys -- they're all ready to go. The week off definitely helped for a lot of our guys." Malzahn on if he'll run some trickery against the Tide: ``Well we're going to do everything in our power to try to score points. Whatever that is and whatever they're giving us, hopefully we'll be able to take advantage of that. It's a big game, so we'll have to see." LB Craig Stevens about 36-0 last season: ``It was terrible, but so was the whole season ... so it was just a bad way to end the season. We're just trying to focus on just getting better and just not re-living that again." WR Darvin Adams on how playing the No. 2 team gets him excited: ``I think it brings out the best. The higher the other team's talent, it kind of brings out your talent. It's like if you're running a 40 and somebody's racing you, you probably run a 40 faster if somebody's racing you. So I think that will bring the best out of us, a big rivalry game. I think we'll be ready for it." WR/QB Kodi Burns on 36-0 last season: ``All of last year ... was just a big mess. So you think about it, but at the same time we really didn't give ourselves a chance, you know, running different offenses every game and everything being in total disarray. It was pretty difficult. But just the fact that we lost to them, I guess that was the hardest part." S Zaccheus Etheridge on watching the Georgia game at home: ``It's definitely hard for any player that loves the game and wants to be out there and knowing you want to be out there with the guys, your brothers that you go to work with every day. But you can't and you're not able to do it. It kind of hurts you. At the same time, things happen for a reason. It was kind of emotional sitting there and not being able to do, but seeing Ben in my jersey, they knew I was there not physically, but spiritually. That just lifted them up a little more." Hey everyone. Had to share this. I asked Darvin Adams about Javier Arenas, the Tide's talented defensive back who will be dispatched to deal with Auburn's top wideout on Friday. ``I heard he's a good punt returner, so I guess he's doing good at that," he said. Wait. He's a cornerback, too. ``Oh. I mean, we'll see." Iron Bowl > other games. He arrived at 11:34. Four minutes late. On being good in the zone de red: ``Down there, we have executed well. Gus does a great job. We have been productive when we get down there. Hopefully we'll have another great plan. It'll be more difficult this week than most weeks to get it in the end zone." On last year's film: ``You want to look at it and see what went on. Uh, 36-0 was the final result. There were opportunities in the game that were missed. That's pretty much what you see. Alabama did a great job. Both teams were physical. When you get in these rivalries, the physical nature of the game has to be on both sides of the ball. Alabama's not going to try to trick anybody. They're going to do what they do -- and try to be more physical." This year's matchup: ``We've had our moments when we played physical football. We've had times when we didn't." On players talking about 2008's game: ``We're not living in the past. This is a new time, a different year. This game won't be any different in terms of the fact that we have to do what we do better than what they do. Last year's game? We've moved on." On if he's worried about players dwelling on the 2008 game: "I didn't worry about the players when they were asked (early in the season) if things were going south because of what happened last year." What's at stake for Auburn? : ``Anytime you're playing a rivalry game, it has th epotential to have a bearing on recruiting. We're trying to prepare ourselves for a better bowl game. There's a lot to play for. This game is not an obligation; it's a privilege ... to play in. Somebody's going to do something, it'll go down in the record books and will never be forgotten. Happens every year." On the crispness of Auburn's offense: ``We feel like we need a fast start. The crispness of our offense potentially plays a role in that. We know we need to start fast." On Ben Tate saying he's the state's best back: ``I'm sure that it was very innocent. I wasn't there. I didn't hear it. Ben is a confident guy. He's also very complimentary of others. He was very complimentary of Mark as well. People can make that into what they want. Do I want all of our players to have confidence? Absolutely." Does Alabama have a championship team? : ``They have players. They're one of the teams that's a viable option to play in that game. I haven't seen everybody else out there. I don't know. I don't know who to compare them to." On Antonio Coleman: ``You've seen a better player over the last three weeks to a month. He was basically playing with one hand. For a defensive linemen, that's a tough situation. Never complained. Just worked hard. He's come along and improved every week. He's overcome a lot of things this year, injury-wise, to contribute to our team." Hey everyone. We're listening to Tiger Talk, coach Gene Chizik's weekly radio show, and we may watch some Monday Night Football in a bit. Since it's Thanksgiving Week, and Le Bowl D'Iron is on Friday, I guess the natural decision for the people at Auburn ISP Sports was to broadcast on Monday. Hans is on the air babbling about who knows what. On how he used the off week: ``It's a fine line between making sure you work enough and getting the rest we need. It's been four straight months of football -- no days off. It was really good to let our football team have some time off. They came back Sunday and I think they were refocused." On being off schedule last week: ``We really tried to focus on the fine details. We concentrated on that and moved on to Alabama." Rod says Alabama is the best team in the conference. Florida may disagree: ``To survive in this league, you have to be physical on both sides of the ball. They are." 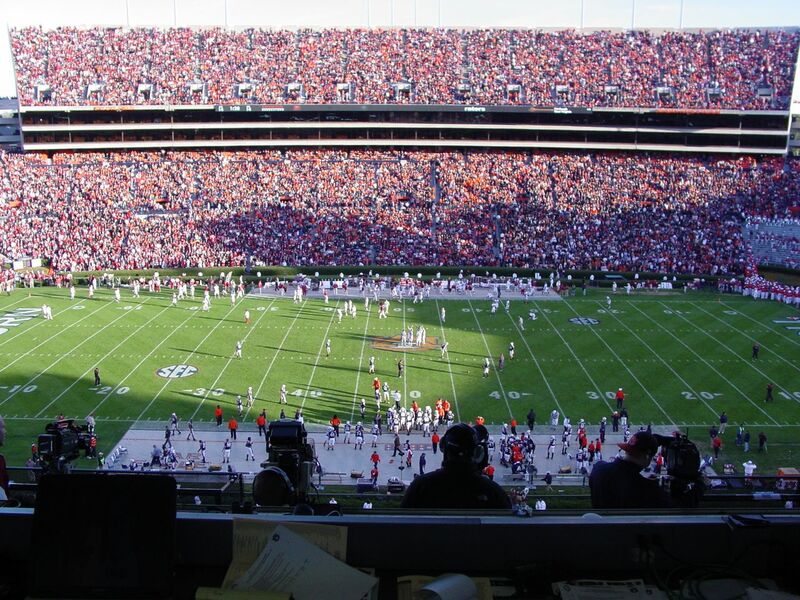 Jane from Auburn wants to know about the 20th anniversary Auburn Iron Bowl and who will give The Big Pre-Game Speech: ``We'll draw on a couple of different people. This week, I've got two or three people to speak to our team. Today, Karlos Dansby called in. We talked for a long time. He said he wanted to talk to the team. I put him on speakerphone with no coaches in the room and let him talk about what this game means. The feedback was tremendous." Jane is still up. She's flipping through her notes. She wants to make sure Saban leaves Jordan-Hare 0-5: ``Good statement, Jane." FIRST CALL of the night (oh goodie) is from Melvin in Bammerham. He wants to know if they're on the radio ("So are you, Melvin," Chizik said) and he loves Auburn and he says it's hard being an Auburn fan in light of Alabama's "accomplishments" and how Alabama fans think Auburn fans are "inferior" and (gasp) he wants to say good luck. No question, of course: ``We're going to have a lot of fun this week. We appreciate your comments." Leigh and Kathy from Auburn want to wish Gene a Happy Thanksgiving and how much they appreciate everyone. No question, of course. And they're having a Thanksgiving dinner at their tailgate spot near Plainsman Park. She's so nice. No question, but she's really nice. : ``I do appreciate that very much. That's what Auburn is about -- it's about family. My wife and I feel blessed. We're in the place we always wanted to be." Ron from Bammerham wants to know if the Thanksgiving break will affect the players: ``We talked earlier about being creatures of habit. We're trying to keep this week just the same -- just as if school was in. We're trying to keep them on the same schedule. That seems to work (Where?) We really don't change anything." T.J. from Bammerham is upset because he won't be able to watch the game. He's going to watch the Leeds Green Wave. No question. That's 1-for-4 from the phone tonight. ``Thanks, T.J."
Meagan from Denver wants to know how Chizik is going to PUMP UP THE TEAM before the Iron Bowl: ``Our biggest challenge is to make sure they're not ready to play the game tonight. Everywhere they turn, they hear it, they see it. They can't escape it. There's not a lot you have to say. When we hit Sewell Hall for Tiger Walk, it'll be all we can to to keep them from going absolutely crazy. I do some things to bring to them the realization of how big this is. We're not playing this game for us; we're playing it for all the people who came before us. Great question." On the 20th anniversary: ``That is such a piece of history. We've got guys on our football from states other than the state of Alabama. Here, when you're on the playground at 6 years old, they ask you: Which side are you on? We're trying to educate them on how this came about. That game was so significant for taking that game from Birmingham to here. There are a lot of similarities of where that game was 20 years ago and where this game is today." Phillip from Murfreesboro, Tenn., is on a cell phone and he wants Chizik to know fans believe Auburn "has a chance" if the Tigers play hard. No question, of course. That's 2-for-6 on the phone: ``We have a chance to win the game. We're playing the game to win the game. We're going to play hard." On Alabama's defense: ``They're very talented. It starts with their front seven. You have to get past them first. They don't give up big plays. Defensively -- they hang their hat on that. When we've had success in games and won games, you can look at turnovers. The same things have happened to them. They're getting the ball back to their offense and they're controlling the ball. That's why they're winning game." On Alabama's offense: "Their offense has some great talent. They have Julio Jones out there. He has great big-play capability. Mark Ingram is fast, makes quick cuts." Bubba from Who Knows said all his brothers and sisters graduated from Alabama and he'd love to "give them hell on Friday" ... and no question. That's 2-for-7 on the phone. ASK A QUESTION, PEOPLE: ``War Eagle, Bubba." Hailey from Tallassee wants to know about Demond Washington. YES, A QUESTION ... though not from the phone: "He's done great. He almost didn't make the first couple of practices. He's really come on this last month. He's really helped our football team." Matt from Auburn, who is about to graduate, wants to say that he'd like to beat Alabama and he thinks Gene has done a nice job. Phone people are now 2-for-8: ``Thank you, Matt. We feel really, really good about what's going to happen down the road." Ryan from Ozark wants to know if Eltoro Freeman will be back ... and how Auburn will stop Ingram: ``With Toro right now, it's really day-by-day. He hasn't been able to do a whole lot. To be able to stop this running game of Alabama's, you've got to be able to put some guys up there (on the line of scrimmage). When you stack people tight, you've got some issues in the secondary to deal with." Paul from Hartselle thinks Auburn can win this game and believes Chizik can get "75 young men" to defy what "10,000 non-believers" say Auburn cannot do. He thinks Gene is a good coach and a fine man. NO QUESTION: ``Very nice comments, Paul. Thanks." On the players' appreciation for the game: "They're in the middle of the forest and they cannot see the trees. We're just trying to educate them about why this rivalry is the way it is." On getting ready for the big game: ``In our team's mind's night, it's Tuesday night. Tomorrow it'll be Tuesday but it'll be Wednesday in terms of practice. On Thanksgiving morning, we'll do our walk-through. We'll have some team-building functions and have a Thanksgiving meal before I cut them loose to be with their families." On the recruits: ``We've got some great recruits coming in. A lot of them are committed to Auburn and some of them aren't." On the fans: "I want to thank the fans for what they've done all year long. I'm really excited for them and I appreciate them." THAT'S A WRAP. 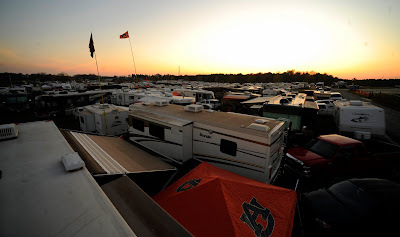 "Until next time, War Eagle. So long, everybody." Hey everyone. One of most esteemed HOTTIEs, JD The Biscuitator, requested earlier today that we talk with one Bruce Feldman of ESPN The Magazine, ESPN.com and the literature scene for his ideas about the Tigers. That was a fine idea. So I spoke with Feldman earlier today from his plush pad in suburban Los Angeles, where he no doubt is working on his next great piece of prose. You should have his blog bookmarked. Also, his 2007 book "Meat Market," which examines how Ed Orgeron recruited at Ole Miss, deserves your time at some point. 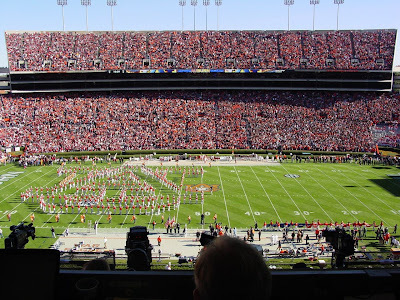 Q: So what have you noticed about Auburn from your perch on the West Coast? A: He had such a splashy start. He beat West Virginia, which was a pretty good win. Won at Tennessee. They had a lull, sure, but to be 7-4 right now? That's a good year. There was such a negative blast of publicity with his hiring because people were so focused on what he did at Iowa State. That was deceiving. 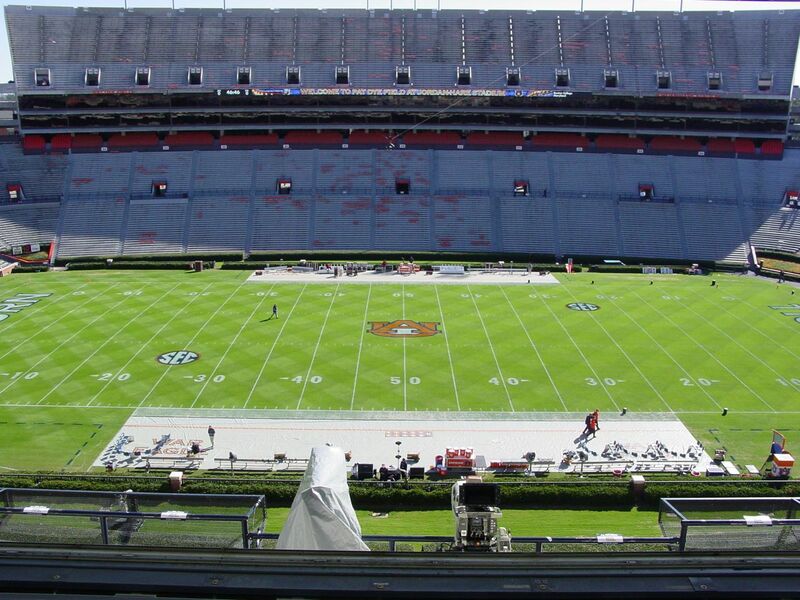 Auburn fans should be pleased with what they have. Q: His start certainly was inauspicious -- with Barkley ripping him on the air and the 5-and-19 stuff. Did you hear much about that? A: Not so much about that, but it was amazing to me -- to the national people -- that there was such an outcry against Tuberville. He had a bad year. Still, he didn't have all the stuff Fulmer had at Tennessee. I'm talking about the "Fulmer Cup" and all that. He had won a lot of big games and he'd beaten his arch-rival in the hardest of rivalries. 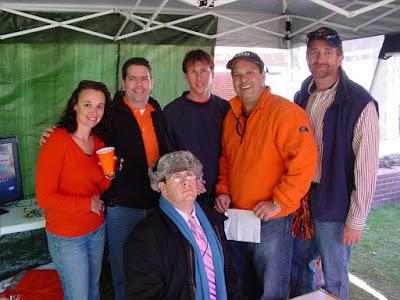 Q: Has your opinion of Chizik changed since he was hired by Auburn? A: It's clear that he's a better coach now than he was three years ago. He was a really hot name three years ago, but he learned a lot from what happened at Iowa State. I can see him running things more intelligently at Auburn. Plus, you have to give him some credit for what has been happening at Iowa State this season. He was putting that program together from nothing. They had something when (ISU) started this season. Q: What has been your opinion of their recruiting effort? A: If they can close, they'll improve quickly. He clearly has good recruiters. It's harder now because Saban is there, but Georgia has slipped so far. That will help Auburn a lot. Those guys can move into Georgia and get kids that (UGA) would have locked up a few years ago. Now Auburn has that momentum. One thing that really surprised me is how NFL guys see Auburn's talent level right now. I was talking to a scout the other day about Auburn and he said there's just not much there aside from Tate, Antonio Coleman and one of the offensive linemen. I'm guessing he meant Ziemba. He said they don't really have many play-makers. It surprised me to hear from him how depleted they are. That's not what I'm used to hearing. Q: Where do you see Auburn in three years? A: I think they're one of the three teams to watch -- it's Auburn, Arkansas and Tennessee as the upcoming programs. You still have Alabama and Florida at the top. LSU? I'm not sure about that anymore. There is room for someone to move up and it could be Auburn. They'll have a chance. It's cyclical. Alabama can't get every recruit out there. Florida can't get every recruit out there. If Chizik is smart, and I think he is, he'll make good decisions about which recruits to target and he'll improve that program very quickly. He already has. Hey everyone. I will be doing my weekly segment on SuperSport 930 out of Jackson, Miss., in a bit. That extravaganza will begin around 9:05 a.m. 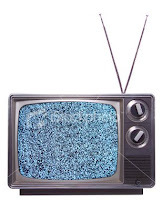 Since they will not be broadcasting new shows later in the week, the time is NOW. On getting some time off last week: ``You hope that just mentally as well as physically, you hope it was enough to escape the craziness around here." On Auburn not being in school this week: ``It's somewhat of an advantage. They can spend some of their own free time voluntarily coming in. If they want to come in and do a lot extra -- and a lot of them already have done that -- we'll do that." On if he'll encourage extra work: ``I'm not a guy who likes to vary off the things we've done. We're to a point in the year where there's nothing new we can do. We'll do what we do and won't deviate from that." On Alabama's defense: ``They're very talented. That's where you have to start in this league. They're very disciplined. They're two deep. They've got the defense running exactly the way you'd want it run." On Alabama DT Terrence Cody: ``He's a very physical player. He's really good at what he does. He can control the middle of their defense. It'll take two people to block him. He brings a lot to the table when you're talking about defending tackle to tackle." On Eltoro Freeman: ``He's made some good gains this weekend. Hopefully he had made some headway. Will it be enough? I don't know." He was asked about Ingram: ``There's a lot of depth. The execution of the running game sets up a lot of things on the perimeter or down the field. That's where they're tacking on some big plays. They're going to come in here and run the ball. Nothing is going to change." On the tenor of this rivalry: ``There's a huge amount of respect on both sides of the field for everybody involved. This is, in my opinion, if not the … it's one of the top couple rivalries in college football and it's because the fans make it that way. When you get on the field, that's where it gets physical. It's one of those games where the toughest, roughest and most physical team usually wins the game. " On how Auburn can get to that level: ``Your chances of winning a huge rivalry game is in proportion to how you prepare for it. That's what our goal is -- to do everything we can to prepare for it." On his memories form the 2004 game: ``I just remember that it was one of those physical games. It was a hard-hitting, field-position game. It was close. It didn't matter at the time how many they had won or lost -- they were going to fight." Hey everyone. So I was telling you the other day about my story on Gene Chizik and how I was talking with people on the periphery about him. The first person I called was Chris Low, who does an outstanding job blogging about the SEC for The Worldwide Leader. I have him bookmarked. You should, too. A: I wouldn't say 180. I didn't think the program was totally in the tank. It came down to a bad decision by Tommy Tuberville in hiring Tony Franklin. That didn't work out very well. It wasn't like Auburn was down like Mississippi State was. Or even Tennessee. It was a big gamble, taking a guy with a profile like it was at the time, but I have to say: Auburn is looking pretty smart right now. Q: How big of a gamble was it? A:He was the ultimate huh? hire at the time. I had no idea what Auburn was thinking. Q: What has impressed you most about the job he's done? A:The best thing he has done is that he's gotten people to buy in pretty quickly. They have a horrible numbers crunch, especially on defense, but the body of work is more impressive than I expected. They're a play or two away from winning in Athens. They probably should have beaten Kentucky. If you had told me during the summer that Auburn would have a chance to win 8, 9, 10 games, I wouldn't have believed it. Q: What do you think of Gus Malzahn? A: I know this -- athletic directors love him. They like him for the same reasons they love Dan Mullen. He's young, he's bright and he does things that create excitement. You can sell that. A good offense gets the fan base more geeked than anything else. It's like a new toy. I'm not saying he's ready to be a head coach, but I know he is and will be on some short lists. 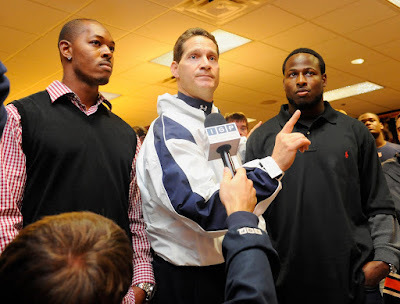 Q: What is your opinion of Chizik as a coach? A: I know he comes off as pretty dry in interviews. He's a lot better with the players. He doesn't let the media see much. One of the things I remember about going down there during the summer was how well he related to the players. Q: What about his approach toward recruiting? A: I think this staff will recruit better than Tommy. He was great in big games, but I think this staff has some guys who will be great in big games, too. I look at it this way: If this staff is going to recruit much better than Tommy and they're already winning 7 or 8 games, they're going to improve on that win total very quickly. Q: What is their ceiling? A: I think they're going to be a Top 4 team in the SEC. Right now, you have Alabama, Florida, LSU and there's room for one more. (Auburn) can get back there. In two years, they'll have a chance to be that fourth team or even higher. They have to get the right quarterback to run Malzahn's system. Is that going to be Tyrik Rollison? We'll have to see. A: Auburn is better than I thought. Had they beaten UK, I'd seriously consider Gene for Coach of the Year. He's accomplishing a lot. Hey everyone. Thanks for being patient while I took a few days to myself. I have family coming in for Thanksgiving, so I needed to work ahead on my stories and help get our house into a presentable state. Now it is. I am ready for IRON BOWL WEEK. Kicking things off is my AP poll for the week.